Buildlink offers a flexible and cost-effective, technically savvy efficient solution for managing real estate. Buildlink allows users to handle information from locally mounted monitors and indicators in facilities to help maintain and utilise real estate information globally - whenever and wherever. Buildlink solutions are supported by newest mobile technologies and are accessible to Buildlink users free of limiting constrictions. Buildlink is a comprehensive solution allowing service providers in various real estate sectors to generate, manage and share information and documents, provide services and administer information produced by users. Buildlink challenges traditional and outdated service models and provides customers with an innovative solution answering flexibly to most real estate information management needs. The new technology utilized enables Buildlink to offer customers a wide range of services at competitive prices. The service provides customer organizations with a general platform for specific technological solutions. The system allows flexible integration of other services and technological solutions related to general real estate data management and concrete operational control, upkeep and monitoring systems mounted in facilities. 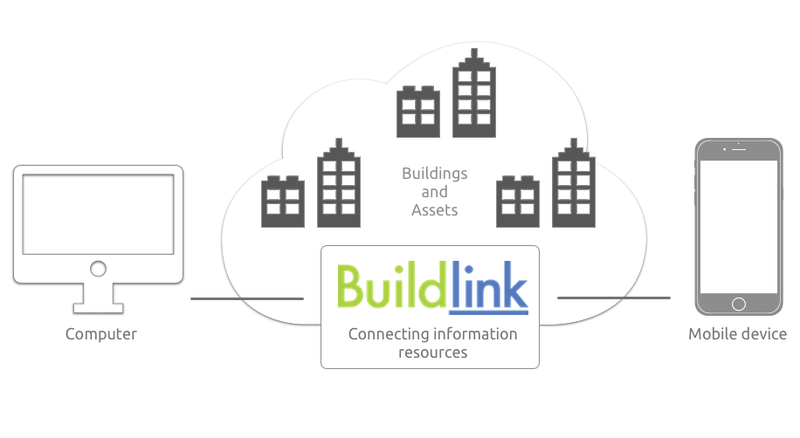 All Buildlink services are connected and linked to buildings and are easy to manage. On facility-specific displays users can find basic information on buildings, related users - e.g. upkeep service providers, caretakers, housing company representatives - as well as documents and links to other services. 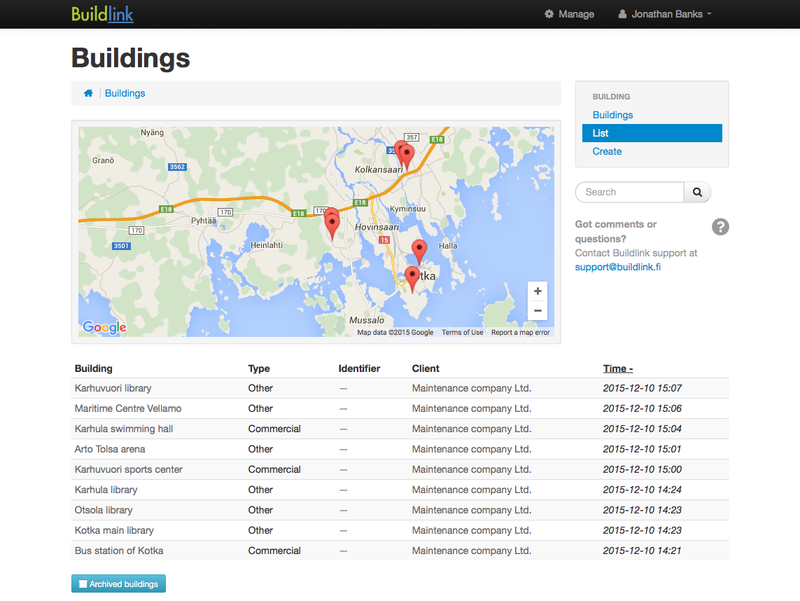 Buildlink allows managing information related to equipment, monitors and indicators mounted in buildings. The system enables sharing comprehensive, relevant and timely information with facility users and other stakeholders. With Buildlink users can save, share and send documents like bulletins, instructions manuals and marketing materials to targeted customers and other Buildlink users. The service allows users to attach and link various documents to facilities and specific locations in buildings. 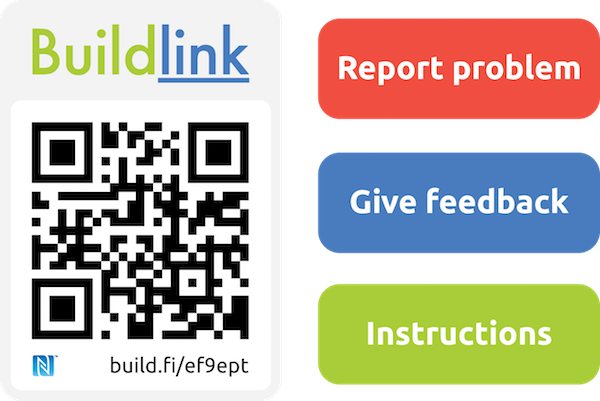 Buildlink enables users to create, administer and monitor the implementation of tasks to be carried out in facilities linked to Buildlink. 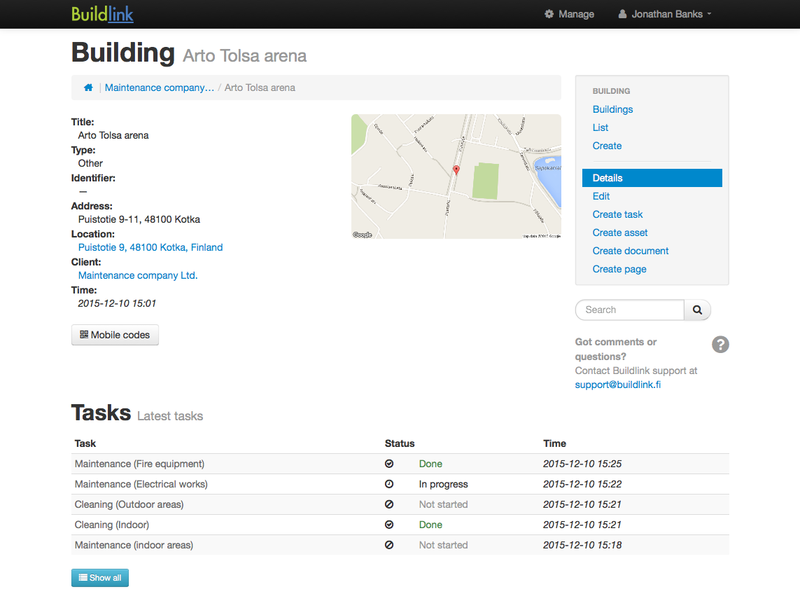 Tasks can be allocated to specific Buildlink users and groups, e.g. upkeep service personnel and other service providers. With Buildlink your organization can manage upkeep and maintenance of facilities more efficiently. Buildlink enables controlling, monitoring and supervising the activities and tasks carried out by customers, service personnel and other users networked in Buildlink. With Buildlink those responsible for real estate management can evaluate and ensure the efficiency and quality of maintenance and upkeep services. In Buildlink service organizations can create users and provide them with access to various functionalities in the service. Buildlink enables users to control the sharing of information and services. Buildlink is a useful link and a flexible channel for communication between various real estate stakeholders. The service produces statistics and reports in the use, maintenance and upkeep operations in the buildings connected/linked to Buildlink. Buildings, concrete locations and equipment installed in them are linked to Buildlink services with mobile codes that provide access to digitalized information. Thanks to its advanced and scalable interface service qualities Buildlink services allow users to integrate other information systems into Buildlink services. The interface solution enables automatization of functions and transmitting information between various systems. Real estate locations where Buildlink services are utilized can be facilities e.g. warehouses or other buildings owned by a company; property of a customer organization, e.g. a housing company; or facilities where the company delivers e.g. machinery, equipment or appliances. A company manages real estate and equipment, machinery and appliances mounted in them. Roles assigned technically to different users can be those of: system managers, workers and employees, subcontractors and service providers, customers and clients, and other networked groups. Users may be granted permissions to utilize various Buildlink services. Users can manage internet content, documents, tasks, maintenance operation and other information related to buildings and facilities linked to Buildlink service. Buildlink service provides information and services to customers, workers, and other networked groups by mobile code-wise accessed information. The mobile codes are locally mounted carriers of information linking all information producers-users. In spite of its multi functional nature Buildlink is easy to deploy and use. The deployment and installation service to Buildlink customers covers an introduction into the system and its use, specification of customers’ needs and an implementation of the agreed service solution / model. Buildlink offers extra services in cases where a customer organization needs technical guidance and support in building information infrastructure to enable the implementation of the desired Buildlink service solution. Many risks often related to an introduction and use of a new information system are minimized when the services provided by a Buildlink customer are analyzed and tested in practise before their full implementation. Maximum benefits and advantages are gained by an enterprise with a valid and smart implementation strategy. The common ground for service provision by Buildlink is found by conferring with customers so as to define the specific needs of organizations. Concrete facilities and related information produced to use, manage, upkeep and maintain them form the basis of Buildlink service solutions. Discussions with Buildlink are in any case useful so as to profitably integrate Buildlink into the organization’s service provision and information processes. Buildlink customer organizations are provided with user training - new working methods and processes always necessitating changes in established ways. The training aims to help a company’s employees to realize the surplus value gained by the use of Buildlink. The concrete training makes it easier for an organization’s employees to commit themselves to Buildlink service use. The deployment of Buildlink services covers user training and further user support material found on the Buildlink service site on the web. Surveying the potential demand for new and modified real estate services is vital for enterprises operating in the field. Concrete uses and functions of facilities and buildings are constantly changing - very often due to introduction of new technological solutions. Buildlink continuously gathers feedback from Buildlink users and welcomes any suggestions for improvements to better meet the information service needs of real estate management professionals. Use of mobile devices (e.g. smartphones, tablets) is constantly on the increase due to a rapid technological development. These devices function as efficient portable computers, enabling receiving and using information in real-time, providing users with a channel for giving instant feedback, besides facilitating other more traditional communicational needs. These devices also function as general power sources and are loadable with softa used for various purposes. With the user friendly Buildlink service users can create and administer interactive web pages. The service offers a wide repertoire of forms to allow easy collection, saving and sharing of information. Buildlink service is based on the very latest responsive technologies making it possible for users to access and use the services with all devices, including mobile devices (smartphones, tablets). The user will not have to acquire, load or update any separate applications, Buildlink offering comprehensive solution for the user. The displays and functions are similar irrespective of the device used to access and use Buildlink services. Buildlink services create a completely novel and unique user experience for customers who previously had to wrestle with outmoded practices - Buildlink taking real estate information services onto a new level. Buildlink operates on the standard mobile codes. Using these codes any physical facilities (e.g. monitors, meters) or locations in buildings are linkable to the web services provided by Buildlink. Code reading is not limited in any way. Buildlink offers the customer a user friendly and efficient way to organize and administer real estate information linked by the mobile codes to the Buildlink web services. Dynamic unique codes. All codes are dynamic and unique. The user may place various codes in the same location or building to enable code-wise monitoring of operations (e.g. services carried out) in locations. Codes can be administered as individual codes or groups of codes. Buildlink converts long and complicated web page addresses into shortened URL-addresses. The information load in the system is optimized to improve usability of the service and to ensure its functioning under challenging circumstances that might compromise retaining and using critical information by Buildlink customer organizations. Reporting and monitoring use of Mobile codes. An organization can monitor the use of codes. All instances of code using are saved in the log files of the user. Dates, times and information on the devices used to read codes to access information via codes are saved and retained in the system. 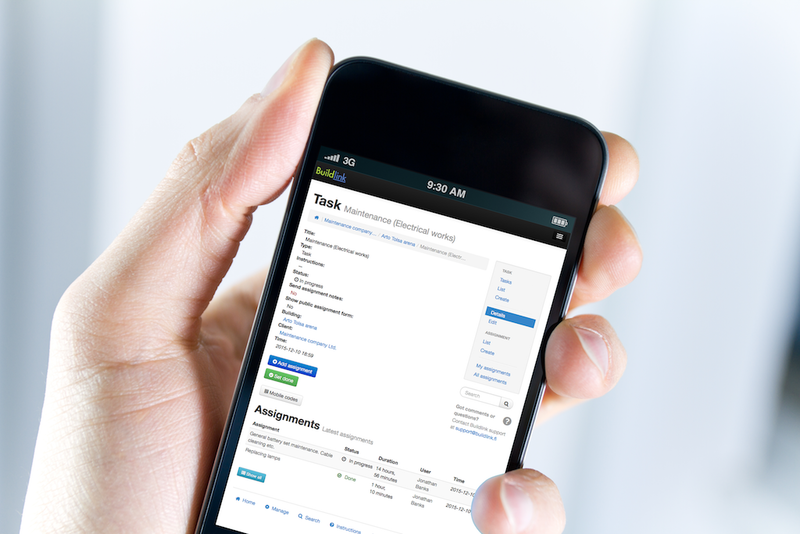 Using mobile codes Buildlik users gain a flexible access to information resources with any mobile device. The service guarantees that relevant information is accessible and utilizable in pertinent contexts. User organizations and users are provided with ready-to-use Mobile codes by Buildlink. Users are free to place and attach codes in locations once they have received them. Codes are provided in various forms, e.g. as sticker code rolls and in different print sizes. Extra stickers may be placed in locations to enhance the visibility of Buildlink tags or to indicate their intended functions. 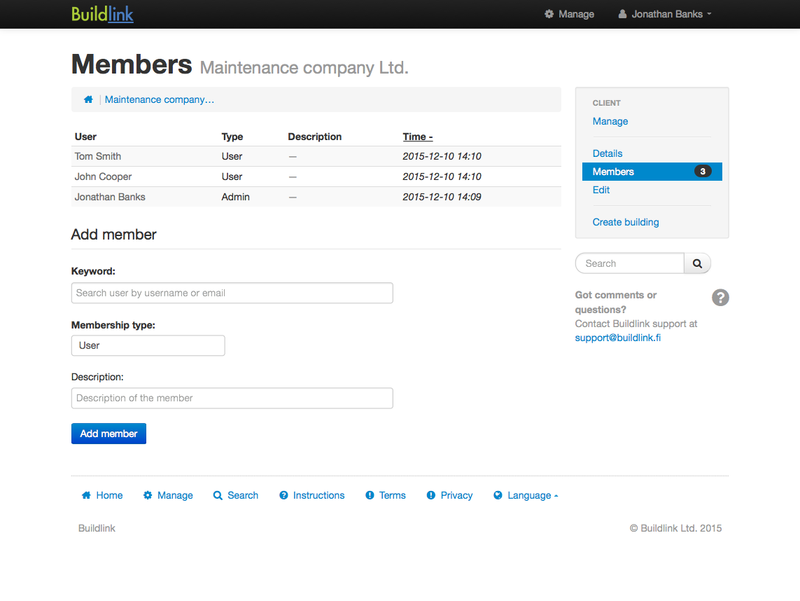 Register as a Buildlink user and request a free trial for your organisation. Please contact us if you need further information about the service. We can arrange a meeting where we can discuss your organisation's needs and possible solutions.